How can our baby be a year old already?! Susanna had a nice birthday, with Grandma and Grandpa coming for it—she had a butterfly cake. She didn’t really care for eating the cake, though. She now is off Mama’s milk and loves cow’s milk. The first and only kid in the family who will drink cow’s milk. We had to practice some tough love early in the month to break Susanna of her habit of waking up at night. It just took one night of her screaming for 2 hours in the middle of the night. Now she sleeps well again. Susanna took her first steps on the 18th. She won’t voluntarily stand up and take steps yet, but if we put her up on her feet and give her something to walk toward, she will take a few steps before plopping down. 2 more teeth this month—one is even a back tooth. Susanna loves going up the steps—we have to be very careful that she doesn’t have access to them because she will be up them in a flash. 2nd—Susanna stood up without pulling up and walked across the kitchen floor! The first evening Rachael and Liam had gymnastics, Susanna just took off walking. She toddled all around the little waiting room, even stopping and changing direction without falling. By the end of the month, she has become a pro! 3 new teeth this month—whew!! Ready for them all to be in! 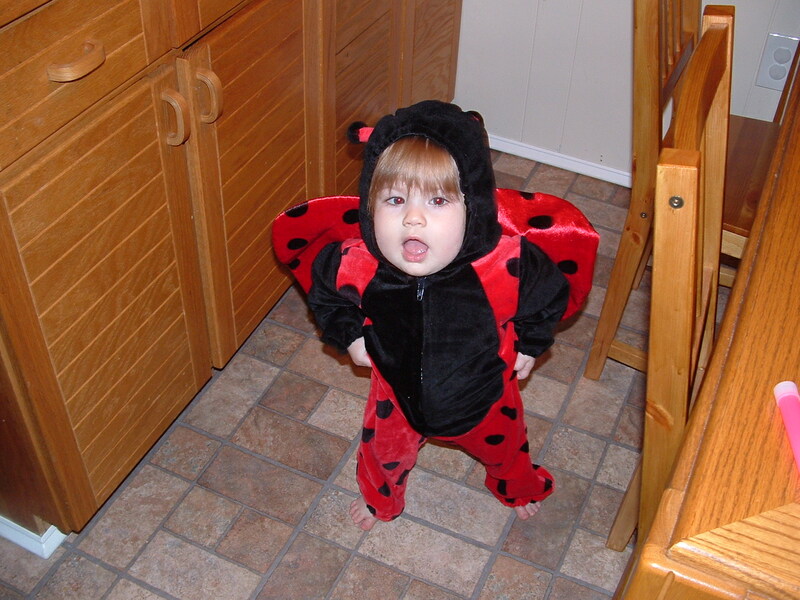 Susanna was absolutely adorable as a ladybug for Halloween this year. Right now her favorite foods seem to be yogurt, cereal bars, and mandarin oranges. Cocoa Puffs and Cheerios are Susanna’s standard breakfast these days. 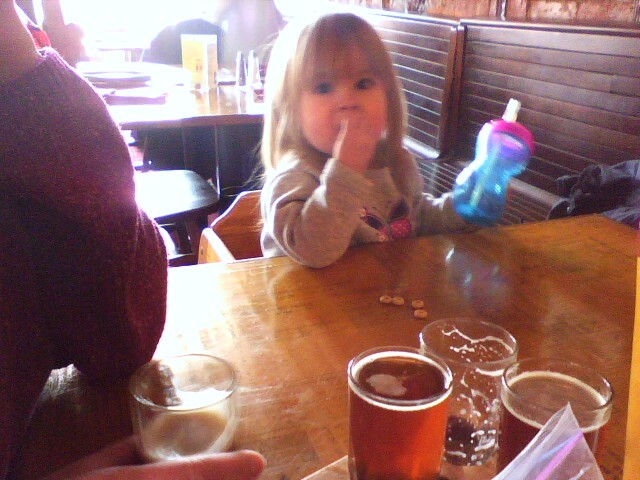 We have also discovered she has an affinity for beans—lima, kidney, black—she will eat just about any of them. She is also beginning to talk more and more. She has a repertoire of about 30 words that we can recognize. She will even put some together into a sentence occasionally. Cereal bars have fallen by the wayside and have been replaced by Ritz crackers—Susanna goes nuts when she sees the box; goldfish crackers are a close second. She has come out with a little devil of a personality, stealing Rachael’s and Liam’s things and then running away. She loves “kissy face” and sticking her tongue out at Daddy. Susanna very clearly said the word “Rachael” early this month. She gets very excited in the afternoon when we are waiting for Rachael at the bus stop. When the bus comes around the corner, Susanna will yell “bus, bus!”; then when Rachael gets off it’s “Rachael!” She also says “Yum” which we take to mean “Liam”. Susanna definitely knows Santa to see him. 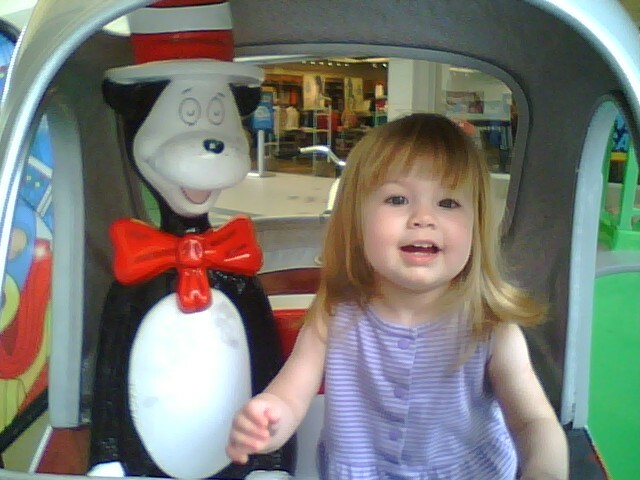 She also loves kissing any doll or stuffed animal she gets her hands on. 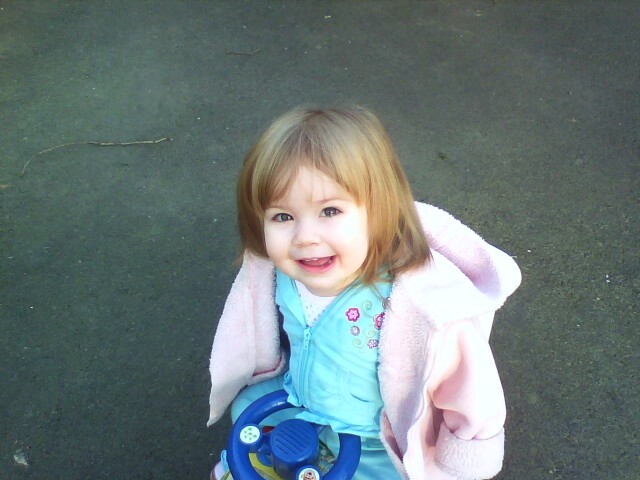 Susanna loves playing Ring Around the Rosie, or “Rosie” as she calls it. Her love of yogurt seems to have subsided a little, but she will now eat cheese and noodles. She is quite good about trying whatever the rest of us are having for supper, especially if Mom forks it into her mouth. Her vocabulary has just exploded—we have lost count on just how many words she says. We got a big snow storm this month. Susanna isn’t quite sure what to do in all that snow. She really loves playing with an alphabet toy she got for Christmas—it goes on the fridge and you put letters into it and it sings a song about the sounds each letter makes. She will push the button to make the song start, and then dance around the kitchen. One of Susanna’s favorite activities is to pull all of the video tapes off the shelf—not only that, but she pulls the tapes out of the cases, too. Mom, Rachael, and Susanna had a girls’ weekend over Easter, heading to Grandma and Grandpa’s house while Daddy and Liam had a weekend together. Rachael and Susanna’s favorite pastime was playing in the water fountain in Grandma and Grandpa’s back yard. The Easter Bunny even found us while we were there. Susanna has developed the same love of books as Rachael and Liam. She even sometimes has the patience to sit while Mom reads one to her. We had fun over the past several weeks, “growing” our own butterflies. We watched them go from caterpillars—watched them eat and eat and grow bigger and fatter. Then they spun their cocoons and then we had butterflies. The kids liked feeding them oranges and watching them flutter around their “house”. We took them to Grandma and Grandpa’s house and let them go. One hung around for awhile and let the kids hold it. 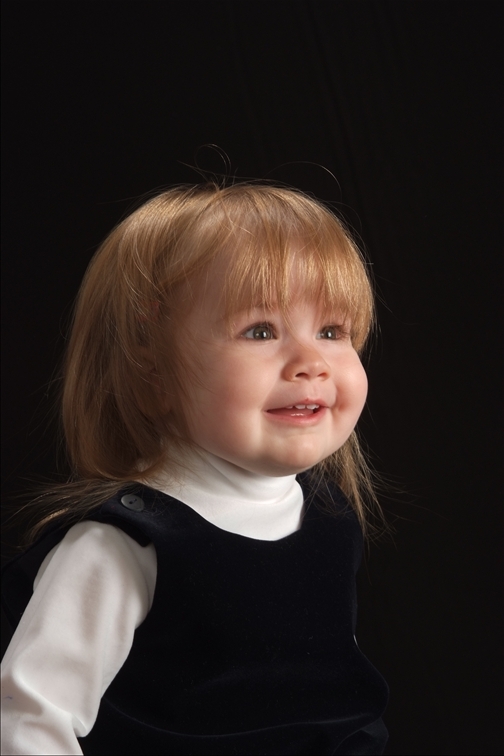 Susanna had her first real haircut this month—and she did great—she sat still with no tears. When she was done she danced around the salon announcing to everyone that she got her hair cut. Susanna just chats up a storm these days—she holds her own quite well with the other two. She really knows how to get the best of Liam—he resorts to tears quite often when dealing with her. Susanna loves playing with the Fisher Price doll house that used to be Rachael’s. She plays quite well on her own with it, and really seems to have a good imagination with it. We also pulled out the Barbie dolls, and she likes playing with those, too, but the doll house is more her speed right now. We switched Susanna’s crib to a toddler bed this month. More often than not, we find her sleeping on the floor.